Viva® Signature Cloth™ is soft, durable & perfect for all your cleaning needs. When you’re getting ready to clean up something sticky, just wring Viva® Signature Cloth towels out and get right to work. Viva® Multi-Surface Cloth™ traps and locks mess for a great clean all around your home. Trap Mess 2x Better* with Viva® Multi-Surface Cloth™. 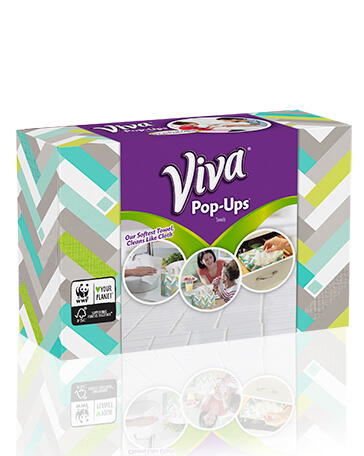 Viva® Pop-Ups™ are dispensed one at a time for your convenience. Hungry for the best clean? Use Viva® Multi-Surface towels at lunch time or anytime you want an exceptional clean.